Forex World – We Deliver Love! Send Money to the Philippines, Send Cargo to the Philippines, Cheap Flights & Travel Packages. Receive SMS confirmation when you send money! So next time you send money, let our customer service know that you would like to receive an SMS notification. Note: SMS notification will be delivered once your transaction has been finalised by our processing team (approximately 2-3 hours of receiving your instructions). Forex has been operating for over 17 years. Proven to be the most trusted and reliable Remittance, Cargo and Travel service to the Philippines. Forex RapID is our electronic based customer verification system that allows us to process an ID verification request giving us a result in minutes. Sending money to the Philippines? Save your loved ones from the hassle of picking up remittances. Remit to BDO Kabayan Savings! Forex offers a variety of convenient transaction types so you can send your money to your loved-ones fast. Amazing travel promo deals and fares! Send or order your boxes now! As of August 12, Forex World will no longer accept Cash Deposits into our bank accounts for remittance purposes. Forex is happy to announce that we have secured a new bank account specifically for remittances transactions only. Forex World is now ARCPA Certified! Forex World is proud to be a Certified Member of the Australian Remittance and Currency Providers Association. Welcome to our website! Please enjoy your stay. Track your box during and after it's delivery with our new system. Be updated on your remmittance online. Track it now here! We are shipping weekly! Check out our shipping dates. We would love to hear from you! Leave comments or suggestions. We have been sending your cargo 'balikbayan boxes' to the Philippines since 1997, and now offering a wider range of services from money remittance to travel needs and many more! We are proud to be of service to majority of Filipinos and their friends in Australia every year by helping bridge the gap between them and their loved ones in the Philippines. We are driven to provide you with the most reliable service available you can trust. With robust proprietary remittance program and systems in place which incorporate customer verification and screening (which are used by Global Banks) to ensure highest level of compliance is met as our obligation under the AML/CTF Act. Partnered with the biggest banks in the Philippines who are regulated by the AMLC to facilitate our customers transactions and distribute funds to their loved ones. Forex World do not compromise on quality and security. It is our lifeline and main point of difference against our competitors. Family owned and operated for over 17 years. Proven to be the most trusted and reliable Cargo and Remittance service to the Philippines. Trust is the hardest yet the most rewarding bonds any business can gain from a customer. We also understand that if it not taken care of, can easily be broken which is why it is our sole focus to remain transparent during any interactions with current and prospective customers. This is why many of our customers over time have become more like family. Hello to everyone at Forex, My package arrived here in Manila yesterday, the highlight of my (and my daughter's!) day. Everything was intact and arrived in good condition. I just wanted to commend all of you for the excellent service and communication you kept with me during the entire transaction. I especially appreciated the email updates telling me which items had arrived. I've recommended Forex World to several people and I myself will be availing of your service sometime again this year. I do know you have a very good reputation, so I thank you for your companyâ€™s integrity and am happy to do business with you. I just want to say thank you for your excellent customer service. Those urgent money transfer I requested to be processed was received on the same dayâ€¦.thanks. 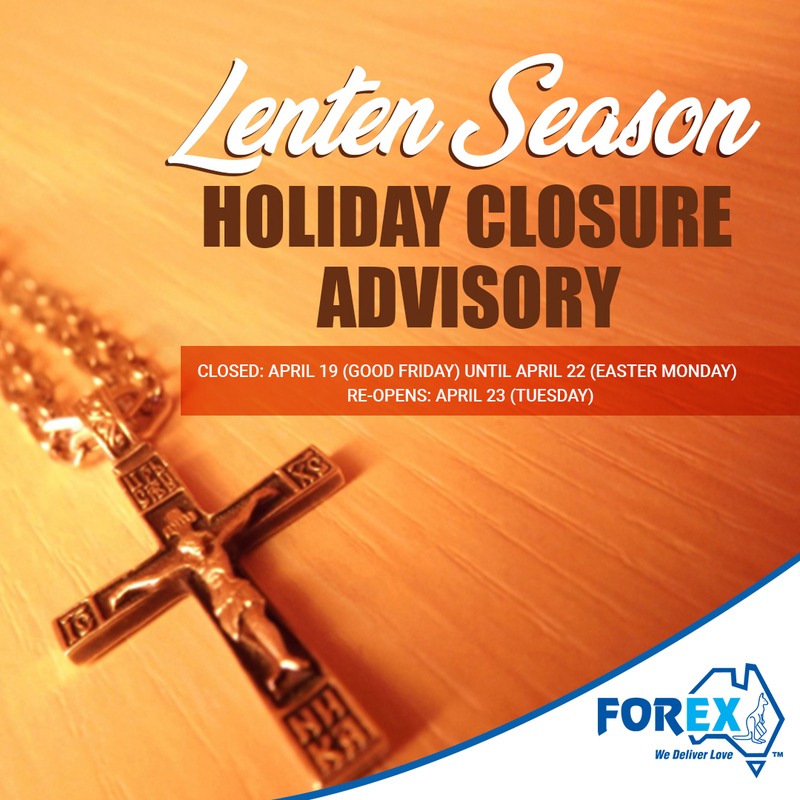 I would like to thank FOREX Australia people for excellent services they rendered to me for years while I was in Australia. I recommended them to my friends & acquaintances. I was very satisfied with the way they treated me, theyâ€™re very professional & at the same time theyâ€™re like family. More power!!!! Dear Forexworld Team, Thank you for your efforts in getting our package to the desired destination. Though it took longer than usual, given the circumstances with the typhoons we are very happy with the excellent service provided by your team. I love your money transfer service, fast and accurate. Love the encouragement word in your daily quotes too. Overall fantastic!!! Thank you very much for the smooth and precise transaction of the pesos remittance. Every time I am surprised on how easily and rewarding is doing business with Forexworld, comparing with other companies on previous years that took them days instead of hours as you, to receive money from Australia. Now I am glad to use Forexworld and I wish I discovered about you earlier but now I can't thank you enough for your automatic and professional work being so fast and so cheap too! God bless! Package arrived today. Very impressed with your service and will recommend to all my friends here. We have been using Forex ever since you guys started and we are very pleased with the services.Although there's a lot of competitions out there offering lower charges but our loyalty is always with you guys.Keep up the good work!!! This is my first-time here in perth aus. Firstly, i had a problem to send a remittance to my wife thru bank-to bank.,and a double charging here and there. Luckily i had a workmate informed me that forex is great and reliable so i try to joined this group. Its great , the customer service reps are awesome. tnx a lot.. I have been using forex for the last few years, for everything from my new 50" plasma, to my old tool set i wanted to use in the province, even a washing machine. We have been using Forexworld and Cebuana L'Huillier for 18mths - two years. The service is phenomenal both at the Australian end and at Pelenke Office. The absolute best service I have ever encountered , please do not change your company philosophy. Go Forexworld and Happy Christmas and Happy New Year to ALL.. I've been using forexworld to transfer funds to PI for almost a year now and they are reliable. Money Transfer only takes few minutes to get to my family in PI. Their friendly staff are willing to assist your need. Thanking you all for your great work. Looking forward for a successful and continuing business in 2012. Cheers. My wife and myself have been using this facility for more than 3 years now --- cheap and excellent way of transferring money from Sydney to our home towns in Cebu & Leyte Philippines. very reliable,fast delivery.and track the parcel movement.Keep up the good work will used again next time. My first Parcel was successfull delivery to my Family . Happy . Parcell not being open good one. They said delivery Guy was very Friendly and helpfull. It was first pick on the last of 19th October 2011. And they received on the first week of December . I'm happy with this kind of service. Thank you for being so prompt in anwering emails and inquiries. Well done. Sa mga staff ng FOREX, maraming maraming salamat sa inyo, panatag ang aking kalooban pag nag papadala ng pera sa aking pamilya. Naibsan ang aking paghihirap, pag alala at kalungkutan sa aking pamilya. "forex is a worries-free to all hard-working Pilipino anywhere in abroad." Hello to the Forex Team My cousin, has acknowledged receipt of the above transaction with no problems whatsoever and would like to thank the Forex team for a great service. Sending money to the Philippines has never been made easier. Thank you for your reliable, efficient, fast & professional service. I will definitely utilise your service over and over again. I will highly recommend. Hassle-free and friendly staffs. Thank you Forex for serving us...more power and God bless. That's good. 4.5/5 ang rate ko kasi mabilis yung sservice, very accurate. Sa ngayon wala pa naman problema, ok naman ang padala ko. Any suggestions wala pa, mag-oobserve muna ko. Gagamitin ko pa rin ang Forex and narecommend ko na rin. Kaming lahat dito na mga kasamahan ko sa trabaho sa Forex din nagpapadala. I have been with Fore for many years now and have no complaints with their Money Remittance services. Last week, I tried for the first time their Food Delivery Services. It was great! The food was ready as scheduled when I ordered. My family was happy! I have recommended this service to my friends. Hopefully, Forex can tie up with more food chains to offer us more choices. Basta kahon door to door para sa mga love ones natin sa Pilipinas...maaasahan at matibay na serbisio FOREX walang katapat... Mabuhay FOREX... LOVE your service guys sana di masisira ang pangalan niyo.. Thanks FOREX!! Thank you so much for your clear and fast replies and for your words of considerations as your long standing customer! During the years I learnt to value Forex World's reliability as something very precious because so rare in this world. I am following your instructions to easily teach money transfer to my in-laws. Please continue your good and very appreciated work. 'Been living in Japan for 12 years before Australia and my workmate in Hilton hotel introduced me to Forex and been using the company for a long time. What else can I say, they've said everything! All i can say is i'm so happy that Forex Australia have the same warm and effecient service like Forex Japan Well done and keep up the good job! Consistently excellent service. Thank you for the timely deliveries. I have been using your service for 4 years now. You're always reliable with polite and friendly staffs. Keep up the excellent service everyone. Merry Christmas and a Happy New Year. Mabuhay! Absolutely you have an excellent service especially your customer friendly staffs. Good day FOREX.... Thank you so much for your quick response in regards with my package to Manila. They received it just now.... Special mention to Miss Shiela, even Thank YoÃ¼ so much for attending much to my query. God bless you!!! Am so happy for what you did.. Cheers! More power to FOREXWORLD AUSTRALIA!!! I would like to recommend John Arnold Mendoza (support 22). You should be proud of his service, and I believe he is a great asset. Nevertheless, I am writing this letter to recommend him in order to show my appreciation. Emailing is an example that takes a lot of time and effort especially on a busy company. However, often a distressed client like myself wanted to know if the money was sent, because it is for my mother's treatment. Therefore, calling or emailing would be appreciated, but I do understand once again that often emailing or calling is difficult due to lack of time. Although, through John's service I became confident that the money would be sent in a short amount of time, because he reassured me. He also emailed me, and has professionally handled this situation by telling me that the money had been sent. Therefore, he should be given a praise, because he made a professional effort. Finally, I would like to say that the company should take care of employees like him. His tone of voice was professional, but at the same time he has an empathic and a confident voice. This suggests that he understands and he will do his best to meet my needs, and he did. I believe that meeting the needs of the client is greatly emphasised in this company. Although, in reality it is often forgotten, due to busyness at work. As a result, those people like John should be given a pat on the back, and this causes a chain of reaction. Everyone will be once again reminded that these values should be remembered and applied. Once again thank you and I strongly recommend his service. ONE MORE--- AM HAPPY... TO TELL YOU/// THE FOREX DOOR TO DOOR DELIVERY IN MANILA IS VERY FAST. THEY RECEIVED THERE- ONLY A DAY AFTER I SENT THE MONEY HERE. THATS THE REASON WHY.... I,, RECOMMEND FOREX TO MY FRIENDS HERE-- EVEN FOR BOXES. OK. TILL NEXT YEAR. HAVE A MERRY XMAS TO ALL THE STAFF OF FOREX. GOD BLESS YOU ALL& YOUR FAMILIES. Let us thank you for the wonderful and safe carriage of our cartons throughout the year, from Deception Bay to, Virac, Cavinitan. Not one carton has been damaged in transit, and not one single article damaged, or broken A wonderful record, and we will be sending many more cartons after New Year. Hello, I would like to express my "thanks" for your great service. Your staff have been very helpful. Last Friday I was worried that the money I was sending will not be delivered on time due to its amount. But my family able to receive it without any problem. Your staff was very helpful and patient in assisting me. He provided all the instructions/information I needed. Thank you to all the staff who were able to process my request quickly. Just want to compliment FOREX on my money transfer today. Fantastic service and I will be informing my friends and associates. Been a client for years. Ang daling kausap ng lahat ng staff sa Forexworld. They answer in a professional but friendly approach. I always get direct to the point answers. I also had to personally go to their office once because of my box, but I was accommodated so well. When I had complaints, they get addressed in a few hours. My emails get replied to instantly. My boxes sent to the Philippines were all always whole, intact and sometimes arrived there ahead of time. I get updated clearly and timely of my transactions, be it with money or cargo. Im also happy with their competitive exchange rates. Today Forex have shown that they do not only provide good service as part of their job but showed great understanding with their hearts. I really appreciate the team efforts specially today when i had a family emergency. Special mention to the follow up calls of support6 Honey for ensuring that my padala will reach my family today as they needed it urgently.